Here's a wonderful book for those who like art journaling and the nature. John Muir Laws is an artist, naturalist, author and educator. Looking at the many books he has published, you can tell that he loves nature. In 2001, he started a project to create an illustrated guide for Sierra Nevada and drew 2,710 watercolour illustrations over six years. He's very experienced and knowledgeable. This 304-page paperback is informative and inspiring. It's filled with lots of ideas on how you start a journal, what you can draw, record or write down and how to approach different subject matter. There are many tips for drawing, observation, choosing the right tool and most importantly, enjoying the moment. Throughout the book, there are illustrated examples of birds, plants, animals and landscape. Several step by step demonstrations are included. All the instructions are clear and concise. What I like about the book is it's really thick with lots of content. If you ever have a creative block, you can just flip to any page of the book for inspiration. This book reminded me of The Complete Watercolorist's Essential Notebook which is also another thick and informative book (288 pages). Is this a good book for an absolute beginner? 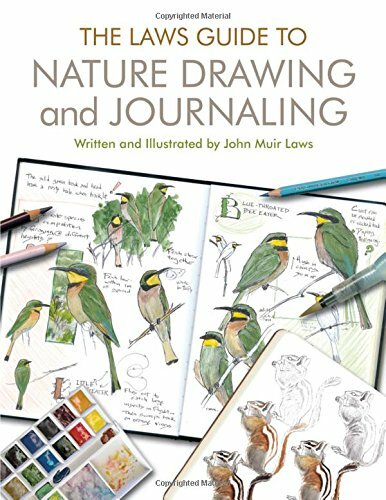 I’d like to start drawing nature specifically, but I wonder if I should start with Dodson’s ‘Keys to Drawing’ or something similar before delving into Laws.